Profile: This student housing expansion includes new construction for a total of 14 buildings with 680 beds, built to an innovative four-neighborhood design around a city center. 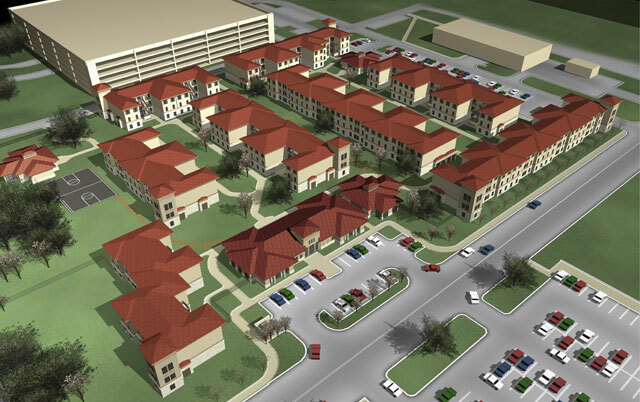 The Commons Buildings feature living/lounge areas, meeting rooms, a game room, office suites, kitchen and laundry. The complex also has two director's units and a faculty apartment, and centers for local and city activities and meetings. The new Roadrunner Café is centrally located and serves the Laurel Village neighborhood both as a cafeteria and a social hub.